Photo: A protester holds a campaign poster of presidential candidate Moise Jean-Charles during a protest against the results of Oct. 25 elections, in Port-au-Prince, Haiti, Wednesday, Nov. 18, 2015. The demonstrators are organized by three political parties who have joined to demand the cancellation of the Oct. 25 presidential election, or removal of ruling party candidate Jovenel Moise who is set to face Jude Celestin in a Dec. 27 presidential runoff election. (Dieu Nalio Chery/AP). NEW YORK—A new report by international election observers concludes that Haiti’s October 25, 2015 presidential and legislative elections fell far short of minimum standards for fair elections, and calls for an independent investigation to address widespread allegations of fraud. 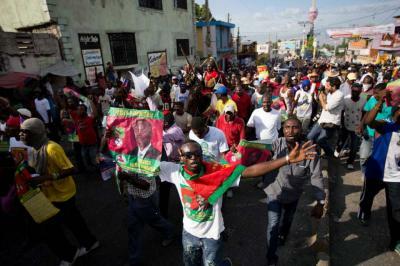 “Haiti’s next government will lack the democratic legitimacy necessary to govern if the deep flaws in Haiti’s October 25 elections are not corrected,” warns Nicole Phillips, one of the report’s authors.